These are porcelain planks that have been installed in the lower level of a Middlefork Development home. Once the color was selected, we then stained the white oak floors on the upper levels to match – seamless transition! On the backsplash is a beautiful mosaic creating a modern circular pattern using natural stone. Whether or not you’re new to tile or have been seduced by its beauty for years, tile can be utilitarian or a piece of art. Taking a deeper look into “The Art of Tile” (the title of my favorite tile book by Jen Renzi), your tile selection and installation will leave your artistic impression on your home.. But with all the available textures, colors, designs, the context of your home and your personal taste – how do you choose? There are manmade porcelains that are fantastic for large areas on a tight budget. In cities like Chicago, where we like a seamless connection with our lower level living spaces, “wood-like” porcelain plank tiles are one of the greatest inventions. As our lower levels tend to incorporate energy-efficient radiant heat (which could warp hardwood), this is a perfect, cost-effective solution. Identify the best color that reflects the hardwood you want throughout the balance of your house and stain your hardwood to match the porcelain tile. This makes for a smooth transition that will surely impress. Marble, or any natural stone, is a fantastic way to channel your inner artist! Because this material has been used and worked into countless applications the evolution would impress Darwin himself. From mosaics to slabs, it’s the organic movement in the “pattern or non-pattern” of the stone that enhances the application. Natural stone can be one of the more expensive of the tile options, so getting creative with the application can help to create a wow factor while still remaining cost effective. Purchasing larger scale tiles and cutting them on site is another way to potentially save money. This allows you to create a smaller field tile in any size divisible by “12”. 12×12’s are the most readily available and value-driven stone size. It’s also super easy for your installer to cut. Tiling the majority of your space with these cost-saving measures in mind allows you to then spend money where it counts; on mosaics or other specialty tiles in key, high-focus areas. We love the way this master bath turned out! Great example of installation being the driver. Left is a view of the floor where larger scale tiles were cut to frame the room, and a change in color and scale was used to frame the chevron center, or “rug”. Right is the shower where a small scale subway cut was used above the chair rail, and a larger cut below. On the floor you’ll notice another border with a small hex rug. Continuing into the master suite is a slab is used for the hearth, while the fireplace surround is clad in 3×6 subway tiles (of the same stone), trimmed with a profile piece. Simple, clean, elegant and timeless! Who doesn’t love a luxury kitchen? 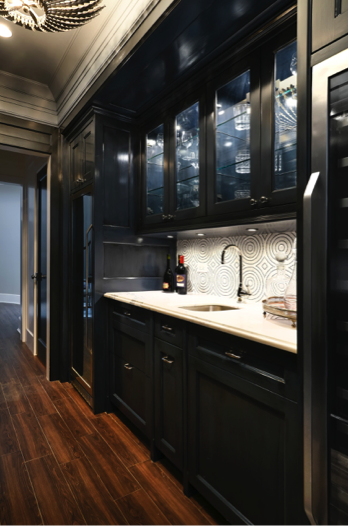 This kitchen utilizes stone in three separate areas:the backsplash uses a custom mosaic, framed by the cabinetry; the outer countertop is clad with an antique-finished granite; and the island features honed statuary marble. All selected to work together to create an elegant background for the kitchen. Tile comes in so many materials, from concrete to metals to glass, yet the words “tile” and “ceramic” are practically synonymous. In fact, “ceramic” is the oldest form of tile. There are so many types of ceramics– as well as shapes and colors – that before you select the specific piece you should ask yourself what “look” you desire. Is it color and consistency you are looking for, or do you love the funky, old world look? Ceramic tiles are mini sculptures and the process to create the ceramics is an art unto itself. There are many variables that go into even the shade of blue that comes out of the kiln. Just like natural stone, the variation is why we love it! Great look for a secondary bath! Pure white subway adorns the walls of shower and continues along the walls as wainscoting, creating a fabulous look – practical to boot! Fear not readers, there are experts everywhere to assist you in your tile pursuit – you just need to know where to look. Specialty showrooms are your best place to start. Regardless of style or budget, the people there are your experts and can become your best friend. They will help you through the process, from design to selection to quantities to ordering. Chicago is a great city for sourcing tile. There are people right here that live and breathe tile. Some of our favorite tile showrooms at Middlefork Development are The Fine Line, Artistic Tile, and Tile Gallery. Give them a call… and have fun with the process!